The project has been developed by The Library with two leading American Anglo-Saxon experts, Kevin Kiernan of the University of Kentucky and Paul Szarmach of the Medieval Institute, Western Michigan University. Professor Kiernan is editing the electronic archive and is producing a CD-ROM electronic facsimile that will draw together in an easy-to-use package all the different types of image being collected. The test image files now on the Internet were mounted to coincide with the publication by the Association of Research Libraries of a paper, Digital Preservation, Restoration, and Dissemination of Medieval Manuscripts, by Kevin S. Kiernan describing the project. The image files have been mounted on two sites, one at the University of Kentucky and another in The British Library [these ftp sites were discontinued after the publication of the Electronic Beowulf in 1999]. These images are for personal use only, and may not be reproduced in any form without the permission of the British Library. Professor Kiernan's paper is also published in Scholarly Publishing on the Electronic Networks: Proceedings of the Third Symposium, eds. A. Okerson and D. Mogge, published by the Association of Research Libraries, Office of Scientific and Academic Publishing, 21 Dupont Circle, Washington DC 20036, USA. For the current  status of the project see Kiernan, "The Electronic Beowulf," Computers in Libraries (February 1995), 14-15. For additional information you may contact kiernan@beowulf.engl.uky.edu. Sponsored by the Association of Research Libraries, the Association of American University Presses, the University of Virginia Library, and the National Science Foundation. s part of its strategic objectives for the year 2000, the British Library has made a commitment to increase access to its collections by use of imaging and network technology. In the spring of 1993, we began as part of this initiative a big "Electronic Beowulf" project, which will in its first manifestation make available in early 1994 a full-color electronic facsimile of Cotton Vitellius A. xv to readers in the British Library and at other selected sites. As this electronic archive grows, it will incorporate facsimiles of many other documents that help us restore parts of the manuscript that were lost or damaged by fire in the early eighteenth century. Plans are already underway, for example, to digitize the late eighteenth-century Thorkelin transcripts of Beowulf at the Royal Library in Copenhagen, as well as the first collation of the manuscript with the editio princeps of the poem. My presentation today [14 November 1993] is the first public announcement of this project. The equipment we are using to capture the images is the Roche/Kontron ProgRes 3012 digital camera, which can scan any text, from a letter or a word to an entire page, at 2000 x 3000 pixels in 24-bit color. The resulting images at this maximum resolution are enormous, about 21-25 MB, and tax the capabilities of the biggest machines. Three or four images - three or four letters or words if that is what we are scanning - will fill up an 88 MB hard disk, and we have found that no single image of this size can be processed in real time without at least 64 MB of RAM. In our first experiments in June with the camera and its dedicated hardware, we transmitted a half-dozen images by phone line from the Conservation Studio of the British Library to the Wenner Gren Imaging Laboratory at the University of Kentucky, where identical hardware was set up to receive the data. Most of these images are now available on the Internet through anonymous ftp or Mosaic. I would like to show you some of the ways in which an electronic Beowulf will provide better access to parts of the manuscript than studying the manuscript itself. The unique copy of Beowulf is preserved in the Cottonian collection of manuscripts that suffered from a great fire in 1731. It remained in its burnt binding until the middle of the nineteenth century, when Sir Frederic Madden, Keeper of Manuscripts at the British Museum, undertook to restore these damaged manuscripts in his care. His bookbinder first traced the outline of each burnt leaf, cut out the center of the tracing except for a retaining edge of about 2mm, and pasted and taped the vellum leaf to the paper frame. Then he rebound the framed leaves in a new cover. The method well preserved the fragile bits of text along the burnt edges of the leaves, but the retaining edges of the paper mounts, and the paste and tape used to secure the leaves to them, hide from view many hundreds of letters and bits of letters. Today they are visible only if one holds a bright light directly behind them, an ineffectual solution if one lacks the manuscript, the bright light, or the permission to use them together. The digital camera at last provides us with a practical means of both revealing and recording these covered letters. The camera easily captures many other features, too, which otherwise require special equipment to see in the manuscript and are difficult or impossible to record in conventional facsimiles. Now, for example, scholars interested in the construction of the original gatherings of the manuscript will be able to place once conjugate leaves side by side again, or examine in great detail the color and texture of the vellum leaves by magnifying the images. Anyone interested in the accuracy and diligence of the scribes, moreover, can investigate all of their erasures, which will be scanned both in bright daylight and with the sometimes more penetrating aid of an ultraviolet lamp. And, with the help of image processing programs, students will even be able to restore or at least improve the legibility of faded passages. Readers of the electronic facsimile will thus acquire a reproduction of the manuscript that reveals more than the manuscript itself does under ordinary circumstances. The slides illustrating this talk are not, of course, the 21 MB tiff-format image files of the original scans, but only the relatively tiny 100K pic-format image files suitable for the PowerPoint software and Macintosh Powerbook I am using today to project slides. In this first slide the drastically reduced resolution nonetheless shows, among other things, the pencil tracings the binders made on the paper mounts on folios 179 recto and 129 recto, respectively the most damaged page and the opening page of the Beowulf manuscript. One can also see the onion-skin tape used to hold the vellum leaf to the paper mount and, at the top of folio 129, some slits in the vellum, perhaps made by the binders to help the vellum lie flat prior to pasting it in. The second slide is also from folio 179, which carries a text written later than the rest of the manuscript. Whether the folio is a true palimpsest (with a new text replacing the old one) or simply a freshening-up of the original text is disputed. In either case, however, we must face the evidence that we are dealing with a mysterious, but important issue in the history of the transmission of the poem. Here I have illustrated that simple magnification allows us to detect how the ink in the capital N has failed to adhere to the scraped vellum. The colored block at the top of the slide not only magnifies the illegible text to the right of the N, but also uses brightening, contrast enhancement, and color-filtering to sharpen the ink vestiges, which in their enhanced state challenge our traditional reading of this part of the text. The circled area at the bottom of the slide highlights some discoloration caused by erasing between the remaining letters when the vellum was wet. In short, the electronic facsimile will permit us to examine the folio in much more detail than was ever possible in other facsimiles or practical in the manuscript itself. The indistinct gray-scale of the old black and white facsimiles of folio 180 verso obscured the fact that the first three lines were deliberately deleted in the manuscript. In this slide the color facsimile shows by the pattern of discoloration that these three lines of text were for some reason assiduously rubbed out, even though the vellum was not subsequently prepared to receive a new text. If the lines were erased in Anglo-Saxon times, we may have here an incipient revision of the poem. As sometimes happens with the vestigial ink in erasures, the text in these opening lines may be clearer now than it was two hundred years ago, when Thorkelin and his copyist, both assuming they were erased on purpose, omitted them from their copies. No modern editor since Thorkelin has ever drawn attention to the deletion. The editors notwithstanding, it may well be more important to try to figure out why the lines were erased than to enhance their legibility through image processing routines. This color scan of folio 192 verso in ordinary light reveals several typical problems, in addition to the handful of covered letters along the top and left margins. There is a large erasure in the middle of line 2 with a scribal correction inserted above the line, which overshadows other erasures and corrections in lines 6, 7, 16, and 18. More noticeable than the latter is the bleeding of the ink in lines 3-6. To treat the variety of problems on the page, we scanned it in October 1993 with a bright daylight lamp, with ultraviolet, and with high-level fiber-optic light held behind the covered readings. To illustrate the advantage of backlighting with fiber-optic light, we scanned the page with the covered bar of the big capital H beginning at line 8. The results were all quite gratifying, except that we ran out of hard disk space on the computer we were using for our experiments. The only immediate option we had for saving the ultraviolet and fiber-optic scans was a removeable hard disk I was hand-carrying back to the United States. All of the data was lost in transit, however, presumably when Security at Gatwick Airport in London insisted on separately scanning the removeable hard disk. I therefore concocted a restored H by "simulated backlighting" by moving an H-bar from another part of the manuscript. This slide illustrates an evolution of our view of folio 192 verso, from black and white to full 24-bit color to ultraviolet scan. The black and white scan (and the black and white facsimile it was taken from) shows little evidence of what was erased in line 2 of the page. The daylight scan, like the manuscript itself in ordinary light, shows more vestiges of the erased material. As the first editor of the black and white facsimile noted in 1882, "to judge from the traces, eowrum cynne was written in the line, ... but [was] erased on account of being even more indistinct" than the damaged words below it in lines 3-6. The ultraviolet scan reveals that the erased reading was indeed eowru[m] cynne, with the first e written over a false start. The extensive erasure and correction show as well that the scribe went to special trouble here to transmit a legible text. When it was first transmitted to the University of Kentucky by ftp, this ultraviolet image file arrived totally black, as if it had been destroyed in transmission. The greenish image in the slide was restored by using high-contrast image processing algorithms that stretched the gray range on a 256-point scale from extreme black (0) to extreme white (255). A green filter was added because it appeared to enhance the contrast even more. As my own simulated backlighting warns, it is important to keep in mind that some of these powerful image enhancement tools are now routinely used in such unscholarly endeavours as advertising, to remove blemishes and undesirable facial hair, for instance, or to straighten a nose or whiten some teeth. With these new tools, in other words, it has become possible to create persuasive forgeries, as in this case, where I have moved the correction from above the line into the line, and replaced the gap with the erased vellum. In June 1993, using blue light (420-460nm) from liquid light guides connected to a new High Intensity Forensic Light Source in the Conservation Studio, we managed to capture and transmit the first facsimile of a fragment from the Life of St. Sebastian in Cotton Otho B. x (folio 54 verso). The text is invisible in ordinary light and was in fact only recently identified by Stuart Lee with the help of an ultraviolet lamp. The now visible portions in the slide read "...godes w..." and "...gen begi...," the only complete word being "God's" in Old English insular script. The first published facsimile of this text was transmitted by phone from one UK to another, from the British Library to the University of Kentucky. These few words cost $55 in a phone bill, but at least they arrived intact, unlike the hand-carried images at Gatwick. They seem to portend the start of something really big, expensive, and earth-shattering. Acknowledgments: The British Library Digital and Network Services Steering Committee oversees the "Electronic Beowulf" project and has funded the substantial equipment purchases used in London, while the University of Kentucky has funded equipment and system support for use in Lexington. The staff most closely involved with the project in 1993 were David Hart and Charles Fischer of the University of Kentucky, John Bennett, an outside consultant, and from the British Library, Michael Alexander of Computing and Telecomms, Dave French and Ann Gilbert of Collections and Preservation, and Andrew Prescott of the Manuscript Collections. Paul Szarmach of the State University of New York at Binghamton and I are the academic directors of the project. Printed version in Scholarly Publishing on the Electronic Networks, Proceedings of the Third Symposium, ed. Ann Okerson, ARL Publications 1994. ISBN 0-918006-73-2. 184 pages. 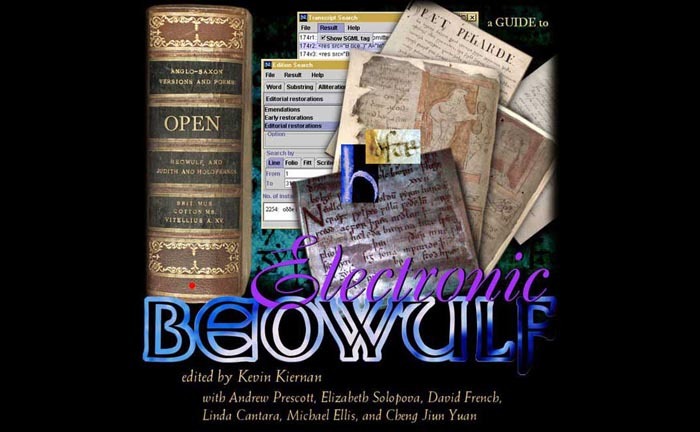 The Electronic Beowulf Project won the 1994/5 British Library Association / Mecklermedia Award for "Innovation Through Information Technology." The "Electronic Beowulf" project is part of the British Library's "Initiatives for Access" program to make its collections more available to the public through new technologies. Beowulf, one of the first sustained imaginative works to emerge from a modern language in the early Middle Ages, holds a special place in the history of Western culture. School children keep it moving from the Middle Ages to the present by reading exciting versions in modern translation that highlight Beowulf's victorious wrestling matches with male and female monsters in his youth and his courageous death in a head-to-head dragon fight as an old man. The text is compelling to grown-ups, too, for its capacity to sustain the detailed intellectual interests of linguists, literary theorists, textual critics, editors, historians, translators, poets, metrists, folklorists, archaeologists, paleographers and codicologists. More has been written about Beowulf, in fact, than any other literary text in the English language. The electronic archive will assemble an encyclopedic resource, founded on the only extant manuscript, of Beowulf materials for all these diverse interests. The unique Beowulf manuscript preserves special problems in addition to the ones caused by the monsters in the poem. In particular, the manuscript was severely damaged along its outer edges in a fire in 1731, and about 2,000 letters subsequently crumbled away along these edges. Toward the end of the eighteenth century, after the fire but before the brittle edges of the manuscript had fallen away, two complete transcripts of Beowulf were made, one by G.J. Thorkelin, the first modern editor and translator of the poem, and one by his hired scribe. In the middle of the nineteenth century, many hundreds of additional letters and parts of letters that had survived were covered along the burnt edges by paste, tape, and paper frames used to protect each folio leaf from further damage in a restoration of the binding. Today the transcripts, now in the Royal Library of Denmark, are essential for restoring the lost letters and for helping to confirm the identity of many of the covered ones, which are still visible to varying degrees in the manuscript when illuminated from behind the paper mounts. This past summer the Royal Library allowed me and David French, a conservator in the Department of Manuscripts of the British Library, to digitize the two eighteenth-century Thorkelin transcripts in Copenhagen. We have also begun to add important nineteenth-century collations of the manuscript with the first edition (1815) of the poem. In the earliest collations nineteenth-century scholars, in particular J.J. Conybeare and Sir Frederic Madden (who later became Keeper of Manuscripts at the British Museum) were able to examine the manuscript before the burnt leaves were mounted in the paper frames. To facilitate its inclusion in the electronic archive, Whitney F. Bolton recently donated Conybeare's first collation (1817) to the British Library. Meanwhile the Houghton Library at Harvard University allowed me to begin digitizing Madden's second collation (1824) and other pertinent material. We had previously digitized the entire manuscript itself, including hundreds of unrecorded letters and parts of letters along the covered edges, which were for the first time made visible by fiber-optic backlighting. All of these images are now part of the Electronic Beowulf, which so far consumes many gigabytes of disk space at both the University of London and the University of Kentucky. The technological complexities of this huge, distributed, electronic archive accumulating around the manuscript have fortunately begun to engage the theoretical and practical research interests of computer scientists, library and information scientists, mathematicians, and statisticians at the University of Kentucky. Because of its age, its broad cultural appeal, and the various damage it has sustained by erasure, fire, and restoration schemes, the Beowulf manuscript presents a number of interesting problems whose solutions will apply to many other fields. To make the electronic facsimile available to others in a useful and usable form, a team at Kentucky that calls itself GRENDL (Group for Research in Electronically Networked Digital Libraries) is developing software that hypertextually links all related images in the archive. A reader studying a given folio of Beowulf will now be able to superimpose enhanced, back-lit, or ultraviolet images over covered or erased readings; bring in for comparison the corresponding pages from a transcript, a collation, an edition, a translation, or other popular portrayals; access an Old English glossary or a related archaeological find; or initiate a bibliographical search and retrieval of a related article. The program is obviously applicable to any text and the British Library plans to use it for other important documents in its incomparable collections. The basic archive is made up of huge 21MB image files produced by a digital camera that scans at 2000x3000 pixels in 24-bit color. With the proper equipment, including an ethernet connection, a powerful workstation with 128MB of RAM and relatively unlimited storage facilities, and a 24-bit color monitor, I as editor can retrieve the gigantic images from England or Kentucky, display them with excellent fidelity, image-process them to improve their clarity, and link them with one another and with other related databases. The challenge is to make the archive truly accessible to those many users who will not have such specialized equipment. We must devise fast, efficient ways to move high-resolution image files across the network and then display them on the customary 8-bit monitors of PCs and Macs without appreciable loss to the quality of the image. Our Unix-based program, already well underway, will next be compiled for PCs and Macs, as well, using scaled images that relatively normal personal computers can handle. The British Library is running a beta-version of the archive in the Students' Room of the Department of Manuscripts. In the next stage of the project we will continue to develop the software at Kentucky and to recover by image processing as much of the covered readings as possible, and then link these enhanced images to their appropriate places in the manuscript. The software already enables me to hypertext or interactively link these images with one another. One of its editorial, compositional, features is that it automatically writes a permanent data file with the coordinates of each image as I place it where it belongs on the relevant folio. Thereafter any subsequent user can choose to view the folio as it appears in the manuscript or with boxed areas showing where enhanced images are available. With the click of a mouse in any of these boxes the user can instantly restore an enhanced image to its proper place on the manuscript page. There are currently ftp sites at the British Library (othello.bl.uk) and the University of Kentucky (beowulf.engl.uky.edu), where anyone can retrieve over the Internet a selection of scaled images from the Beowulf manuscript. There is also a World Wide Web presentation of the project at URL http://www.uky.edu/~kiernan/welcome.html. Thanks to the initiative of my academic co-director, Paul E. Szarmach, Director of the Medieval Institute at Western Michigan University, the Electronic Beowulf is now a project of the new Richard Rawlinson Center for Anglo-Saxon Studies and Research. We expect that the project will eventually make available on multiple platforms and on the Internet a comprehensive interactive electronic archive, an on-line exhibition, and a diversified series of CD-ROM-type packages of Beowulf and ancillary materials for scholars, teachers, and students at all levels. 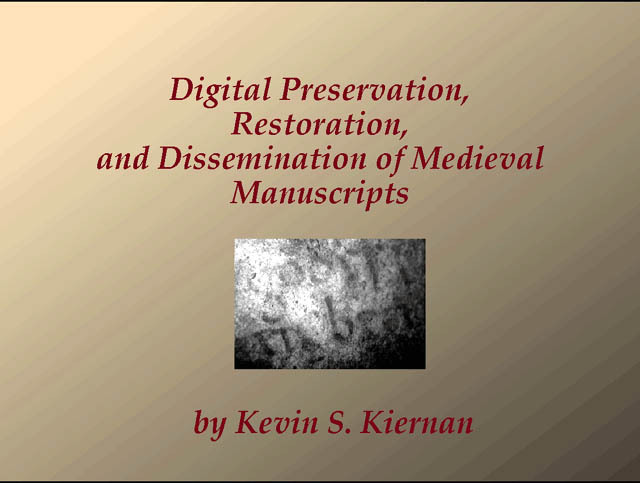 Kiernan, Kevin S. "Digital Image Processing and the Beowulf Manuscript." Literary and Linguistic Computing 6 (1991): Special Issue on Computers and Medieval Studies (Edited by Marilyn Deegan with Andrew Armour and Mark Infusino), 20-27. Ellis, Michael. "Constructing a Glossary for The Electronic Beowulf." Revue: Informatique et Statistique dans les Sciences humaines 33 (1997), 113-123. Kiernan, Kevin S. "The Conybeare-Madden Collation of Thorkelin's Beowulf." Anglo-Saxon Manuscripts and Their Heritage. Editors Phillip Pulsiano and Elaine Treharne. Aldershot, Hants, England and Brookfield, Vermont: Ashgate, 1997. 117-136. Prescott, Andrew. "The Electronic Beowulf and Digital Restoration." Literary and Linguistic Computing 12 (1997), 185-95. Prescott, Andrew. "'Their Present Miserable State of Cremation': the Restoration of the Cotton Library." Sir Robert Cotton as Collector: Essays on an Early Stuart Courtier and His Legacy. Editor C.J. Wright. London: British Library Publications, 1997. 391-454. Prescott, Andrew. "Constructing Electronic Beowulf." Towards the Digital Library: The British Library's 'Initiatives for Access' Programme. Editors Leona Carpenter, Simon Shaw and Andrew Prescott. London: British Library Publications, 1998. 30-49. Solopova, Elizabeth. "Encoding a Transcript of the Beowulf Manuscript in SGML." Paper delivered at the Association for Computers and the Humanities/Association for Literary and Linguistic Computing Conference, University of Virginia, 9-12 June 1999.